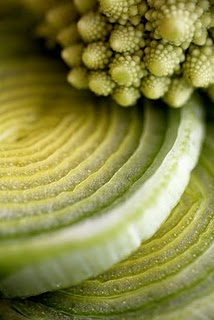 The weekly bounty of our Riverdog Farm CSA box inspired this leek, Romanesco, and Chevre tart. Focusing on what is fresh and available in my kitchen, I am compelled to play with combining flavors - a process that is always a joyous creative undertaking for me. This tart would work well with so many combinations of winter vegetables - I encourage you to play around with your own flavor mix depending on what's growing in your veggie garden or is available at the local farmer's market. This improvised tart recipe was really yummy and I wanted to share with you. Heat olive oil in a medium saute pan. Add leeks and stew for a few minutes, until they are just beginning to soften. Add a splash or two of water (to avoid browning leeks), 1/2 teaspoon salt, and bay leaf. Continue to gently cook, covered, until leeks are cooked. Set aside. 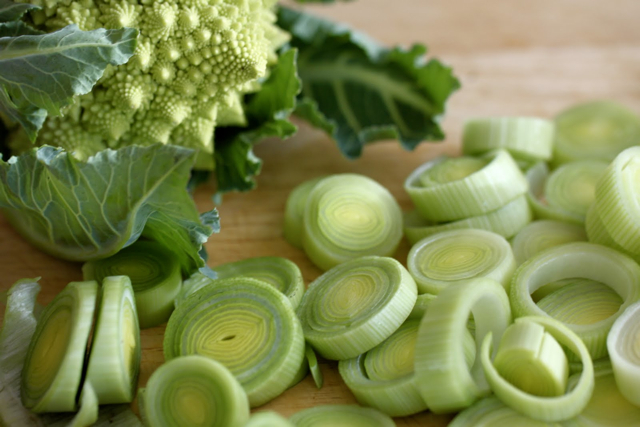 Toss Romanesco florets with olive oil and salt to lightly coat. Roast in 350 oven until tender, but not too soft. Remove Romanesco from oven. Turn up oven to 375. Roll out chilled pastry dough and fit dough into a lightly greased tart pan with removable bottom. Sprinkle bottom of tart shell with Parmesan cheese. Then add the leeks and Romanesco. Dot top of the tart with dollops of chevre. Bake assembled tart in 375 oven for 40-50 minutes. Crust should be golden brown. Romanesco is so beautiful, to me it almost seems a shame to eat it but then the taste reminds me of why I do. This looks like a lovely combination and the photos are simply gorgeous. This sounds absolutely delicious, it's going straight to my "to make" list. Thanks for the creative idea!